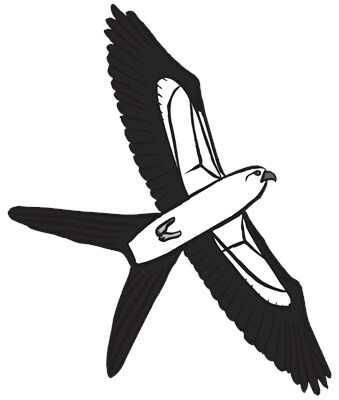 This is a cartoon-style image of a Swallow-tailed Kite in flight. These striking birds are absolutely unmistakable when seen in flight - the stunning black-and-white plumage combines with the unique tail shape to make IDing this beauty a cinch. This simple cartoon-like drawing of the bird in flight exaggerates the field marks of this amazing and beautiful bird of prey. To order by phone, call toll-free at 1-877-809-1659 from Monday - Saturday 9:00am - 9:00pm EST. You'll need to note the Product Number 030-1318990436 to make your order.